OMAHA, Neb. 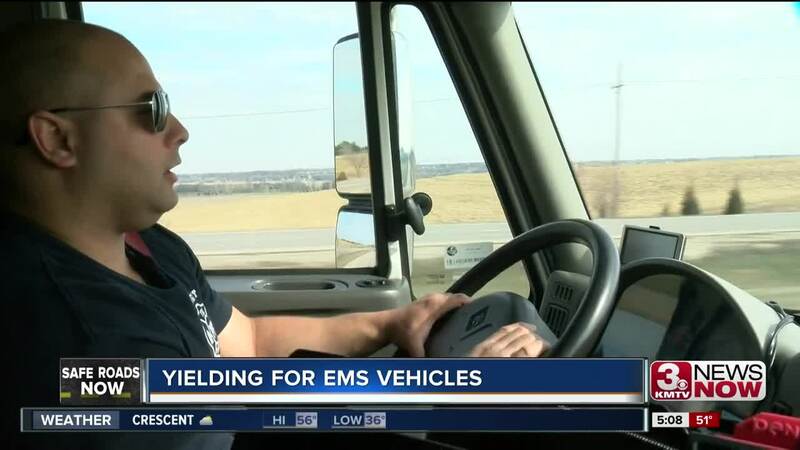 (KMTV) — The dangers firefighters face happen well before they make it to the scene, and emergency crews say there's one hazard they see almost every time they get a call. In today's safe roads now...Courtney Johns caught up with members of the Papillion Fire Department. Firefighters showed her some of the most dangerous things they see other drivers do on the road. After spending 12 years fighting fires in Papillion, Anthony Strawn knows how to keep his cool. "I’m sure there's some people out there that would say I've blown my top a time or two, but for the most part I try to stay pretty calm." Even behind the wheel of a 10-thousand pound plus vehicle, he seems relaxed...but he's watching everything. “What that car's going to do, what my exit strategy is going to be...where I can go to avoid an accident. And the odds of an accident...go up when he turns on the siren. "This is what becomes difficult when a car just keeps doing what they're doing instead of going to the right." When an emergency vehicle's lights are on, drivers are supposed to pull to the right and slowly come to a stop while the emergency vehicle continues in the left lane. When a driver doesn't do that...Anthony has to assume a driver doesn't see him. And if that driver is still in the left lane, he may have to pass on the right... and risk getting hit. But Anthony says it's often the drivers that do see him who cause a crash. "I think they just panic and don't know what to do. Oh my gosh I'm supposed to get out of the way, what do I do?" says Chief Bill Bowes. When that panic hits...fire chief Bill Bowes says drivers often do one of three things... swerve...run a red light...or just hit the brakes. "There's a lot of weight in these trucks, a fire truck carrying a thousand gallons of water, it has a lot of momentum behind it. It takes a long time for that truck to slow down so we're not able to stop on a dime like a car might be able to." Instead, Bowes says drivers should take a deep breath...and if you can't pull to the right...stop where you can and wait for them to pass. When cars don't... it's easy to get frustrated, but Anthony says, like anything...patience is all about perspective. There are two instances when you shouldn’t pull over immediately...when there’s a median in between you and the emergency vehicle and when you’re in a roundabout. In the latter, you should first exit the roundabout and then find a place to pull over.